06: Office Politics - It's election season, and in the midst of a tight campaign, an incumbent New Jersey senator's campaign manager falls ill with liver failure and temporary paralysis. Cuddy pushes House to add a female doctor to his team by hiring brilliant third-year medical student Martha Masters in Thirteen's absence. House and the team are wary of the young doctor's lack of experience and medical perspective, but are forced to give their new by-the-book teammate a chance to prove herself. After the campaigning senator makes a surprising announcement, House and the team look to the candidate to find clues about the patient's condition. 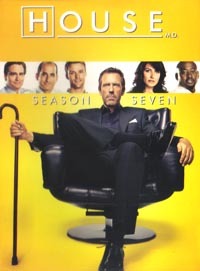 Meanwhile, Foreman learns that Taub has a past connection to Masters, and in an effort to save his patient's life, House must make a critical decision that may compromise his relationship with Cuddy. 07: A Pox on Our House - After a 200-year-old medicine jar found on an off-shore shipwreck shatters in a teenage girl's palm, she is admitted to Princeton Plainsboro for symptoms closely linked to smallpox. When the Center for Disease Control's Dr. Dave Broda institutes a lockdown on the hospital and suspends House's team's ability to diagnose, Masters grows suspicious of Broda's motives and becomes convinced that the patient is suffering from a different disease. The girl's father soon experiences similar symptoms, and House is forced to make a precarious decision that puts his own life in jeopardy. Meanwhile, Wilson and Sam comfort a 6-year-old chemotherapy patient who prompts them to examine their relationship. 08: Small Sacrifices - Science and faith are called into question when a patient is admitted to the hospital following his reenactment of the Crucifixion. The patient, Ramon Silva, refuses to undergo the prescribed treatment, and the team learns that after his daughter's cancer was cured, he pledged an oath of self-sacrifice to God. With little time to save Ramon's life, the team struggles to understand his reasoning and seemingly extreme religious convictions, but eventually learn that faith is not an argument. Meanwhile, Taub questions his wife Rachel about her relationship with an infidelity support group member and the team attends a co-worker's wedding where Wilson's relationship with Sam takes an unexpected turn. 09: Larger Than Life - When a man puts his life on the line to save a stranger who fell onto the subway tracks, he emerges from the dramatic scene miraculously unscathed but then suddenly collapses. Both the hospital and the town become captivated by the man's selfless deed, but as the team works to diagnose his symptoms, they discover that the hero's seemingly life-changing deed failed to break old habits. Meanwhile, House tries to avoid Cuddy's birthday dinner with her opinionated mother Arlene, and Taub draws unexpected attention when his face graces billboards advertising the hospital. As Taub and his wife reignite a physical relationship, Masters' outside perspective helps him realize that it's time to take action on his crumbling marriage. 10: Carrot or Stick - A teenage military trainee at a juvenile offender training camp suffers peculiar symptoms after enduring an intense training course, and mysteriously, his drill sergeant is soon admitted for similar symptoms. Unable to track down the cause of the shared illness, the team searches for clues in the trainee's family medical history, and Masters and House reveal a unique bond between the sergeant and trainee. Meanwhile, when an indecent photo of Chase is posted on a social-networking site following three different romantic encounters, Chase is determined to find out which girl is trying to publicly disgrace him. Also, sensing Cuddy's stress over her daughter Rachel's enrollment at a prestigious preschool, House secretly prepares Rachel for observations and reveals a soft spot for the toddler. 11: Family Practice - Cuddy's mother, Arlene, is admitted to Princeton Plansboro after complaining about unusual symptoms, but stubborn Arlene insists that House be removed from the case, forcing House to come up with non-conventional - and illegal - means to treat his patient. House instructs his team to follow his lead, and they discover details in Arlene's personal life that she kept secret from Cuddy and her sister Lucinda. Later, Cuddy places her trust in House to ensure that her mother receives the proper medical treatment, leading "by the book" medical student Masters to reevaluate her responsibility to practice within a code of ethics and to follow her boss' orders. 12: You Must Remember This - When a waitress with a perfect memory suffers temporary paralysis, her older sister visits her in the hospital, which triggers high stress levels and even more health complications. The patient's sharp memory proves detrimental when a grudge she's been holding against her sibling gets in the way of receiving proper medical treatment, and Masters discovers that patching a broken sisterhood may prove to be more complex than diagnosing the patient. Meanwhile, Foreman volunteers to help Taub prepare for a medical examination, and House, determined to help Wilson get back in the dating scene, discovers Wilson's secret new companion. 13: Two Stories - House participates in a school's Career Day and breaks a few rules by sharing explicit medical stories. Waiting outside the principal's office, he meets two fifth-grade students who assess House's relationship woes and try to help him understand how his selfish antics get in the way of showing Cuddy how he really feels.